Take Advantage of Our Money-Back Guarantee! Our Free Practice Test courses are indefinitely the best way to prepare for your licensing exam. Possibly one of the greatest aspects of some of our programs, however, is that they are offered on a money-back guarantee. Basically, if you purchase one of our courses or practice tests, and do not pass your exam on your first attempt, we will gladly refund your course cost! Driver's Education Courses/Practice Tests - All of our driver's education courses and practice tests are offered on our Free Practice Test money-back guarantee. This includes all Commercial Driver's License (CDL) courses and practice tests as well. Once again, if you do not pass your exam on your first attempt, we will refund your money. Graduate School Practice Tests - Whether you are looking to take the GRE, LSAT, or MCAT, we have all of your educational needs covered. 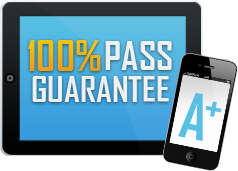 These practice tests are offered on our money-back guarantee as well, which make this an utterly fantastic deal! Professional Certification Practice Tests - Free Practice Test is unable to offer these practice tests on a money-back guarantee. Due to the degree of length and difficulty of these examinations, it would not be beneficial to offer them with our guarantee. This does not change the fact that our practice tests are one-of-a-kind, and familiarize you with sample questions and answers as they are seen on the exam. With or without or money-back guarantee, our expertly designed programs will best prepare you for your licensing exam. At Free Practice Test, we cut through the lengthy documents and manuals, and provide you with the necessary information to ace your exam!